Not everyone likes to dance and for those who don’t breaking the ice with people during the evening reception can be difficult. Many couples look for ways to keep guests entertained during the reception, however, entertainment such as magicians can be outside of many couples budgets. This doesn’t mean you can’t provide excellent entertainment on the cheap. Board Games scattered on tables, or having a board game table during the reception is a popular idea. Even if you don’t own board games you’re bound to be able to borrow a pack of cards and a couple board games from family or friends. 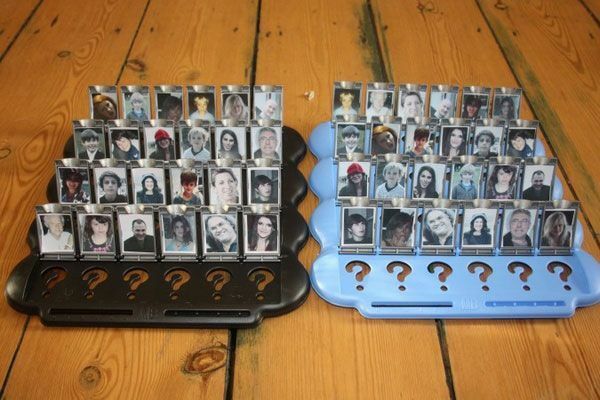 You can get creative and have guests rolling with laughter with personalised Guess Who. Remove the pictures from two Guess Who boards and add pictures of the wedding party (Bride, Groom, Best Man, Ushers, Bridesmaids, Father of the Bride etc). The pictures can be current or from childhood. This idea will work as long as you have 24 people you can use pictures of. Gather your pictures, print off four copies of each picture, two copies on paper (to go inside the slots of the Guess Who boards) and two copies on card to use as the picture the other has to guess. Place the photos of each person in difficult slots on the two boards and you’re all set up. If you’re not sure how to play, view the Hasbro rules here. This idea has to be my favourite! I grew up playing Top Trumps and love the idea of making personalised Top Trump cards using my friends and family. A Top Trumps deck usually includes 30 cards and have 5 categories, but if you can’t create 30 cards, any even number upwards from 22 will work fine. The hardest part was thinking of the categories the game is played with, as I couldn’t find any inspiration on the internet to help me. I wanted the categories to be related to the wedding day as opposed to generic categories. I finally decided upon Likelihood of tears, joker rating, chance of drunkenness, dancing odds and poser status. Guests playing the game in the evening will be able to see if the ratings have come true or not. I created a Bride card and a Best Man card (the names are made up and the pictures are taken from Google image search). With these cards the Bride would win against the Best Man for Likelihood of tears but the Best Man would win against the Bride for joker rating. I’d print these off on card, cut them out and put them in a nice box to place on the games table. You can decorate the cards in your wedding colours and make the design as plain or as intricate as you wish. If you’re not sure how to play Top Trumps, you can find play instructions here. A brand new gift list service only launched THIS YEAR that I have fallen in love with is ‘Recipe Gift Book‘. Many couples getting married live together before getting married so the gifts for the home are no longer needed, so it can be difficult to know what you ask your guests for. You may feel uncomfortable with asking your guests for gifts, but at the same time guests usually WANT to buy the couple a wedding gift, and appreciate having ideas of what you may like. I’ve always felt uncomfortable with asking people for money, so this new gift idea is the perfect solution. Just imagine having the recipes to your Aunts cookies, your grandmothers sponge pudding and your best friends lasagna. This this brand new unique gift you can! The gift is completely free for the Bride and Groom (Bride and Bride or Groom and Groom), and your guests just pay a contribution to submit their recipe. Your guests can submit their recipe, photos and a personal message which will then get made into a hardback in the style of your choosing to be made and delivered after the wedding. The book can then be handed down the generations as a wonderful family heirloom. The H2B and I will be putting the details of our Recipe Gift Book in with our invites as well as putting the details under the ‘Gift List’ section of our wedding website. I can’t wait to get my hands on the recipes of some of my families best meals and treats! Are you a shoe fanatic? Are you struggling to find the perfect shoes for your wedding day? Do you like personalisation? If you are budgeting a max of £150 for your bridal shoes then a website you should most definitely visit is laceandlove.co.uk who create custom made shoes to your own design. You can either provide your own shoes to Lace&Love or you can tell them what type of shoe you would like and they will source the shoe for you. Once the shoes have been chosen you then discuss what colour, materials and items you want to include in the design. From this brief, I’ll create a rough design onto the shoes and send some pictures. At that stage, we can tweak anything. Once the design is approved by you, I fix it all permanently before coating them with a water and stain repellent. They are then bagged and boxed ready to send on their way! The following pictures are taken from the website of Lace&Love and are linked to the website. I’d have the vows on the back of the shoe as permanent reminder of the promises we are making to each other. The time on the clock face could be set and frozen at the time of the ceremony and the other charms would be personal to the H2B and I. For us it would be a car charm and a little acorn charm maybe. The lace put on the shoe could be off cuts from my wedding dress. Lace&Love can help you keep lost loved ones close to you as you walk down the isle. I can’t think of a more special way to incorporate your loved ones who sadly can’t be with you. Lace&Love are based in the UK. You can find them on Twitter here or on Pinterest here. Since January 31st 2015 the H2B and I have been teetotal. Not a drop of alcohol has passed our lips. Our reasons for putting down the booze are slightly different, for the H2B it is health related, where as my reason is purely to support him. I don’t think that we will still be teetotal this time next year, but living life without alcohol for the past 4 months has made me wonder about having a wedding without any alcohol. Obviously a lot of couples must choose to have a sober wedding, but you don’t hear of them very often. When I went to view venues they didn’t even ask if it would be an alcohol free wedding or not, the assumption was there would be a requirement for alcohol. At the time an alcohol free wedding wasn’t on my mind at all, but living without it for the moment has made me ponder they venues don’t question this. How does a teetotal bride and groom have a dry wedding without loosing guests they want to have attend? There must be a number of obstacles to overcome, not to mention what if guests either do not want to come, or do not stay long because they aren’t able to loosen up with a drink? I’ve never been a big drinker as I dislike the feeling of loosing control, (plus I have horrendous hangovers!) so, the idea of going to a dry wedding doesn’t bother me. For some people attending an alcohol-free wedding would be a complete no no as they would feel like they couldn’t relax, especially when it comes to the evening. Should a couple have to disclose to their guests early on that the wedding will be sober? Should there is a mention to choice on the invites? If you have guests that are drinkers, surely it is only fair to disclose this detail to them, just as you would disclose if you are having a childless celebration. If you are facing the fear of how some guests will react to a teetotal wedding celebration, or if you are worrying how you can still make the wedding fun without booze, then I have scoured the web, and thought long and hard for the following hints and tips. You can use the tips individually or combined. Although a 1920’s themed wedding is not for me, I really love looking at wedding pictures from couples who have chosen 1920’s styling for their big day. Pearls and feathers are my favourite ways to subtly or elaborately bring a touch of the 1920’s in to the celebrations. The sleek dress silhouettes are simple and flattering on most figures but especially boyish figures, adorned with beads, peals and thin pleats, lace and ‘visible stitching’. 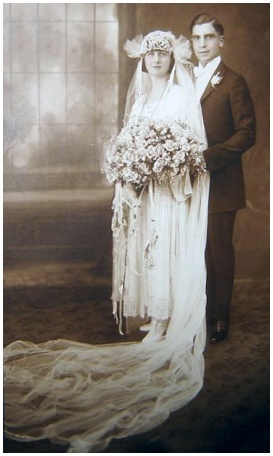 Other features of the 1920’s brides style is statement headpieces or long, draping veils, that cap the head and drape from in front of the ears and around the back of the head. 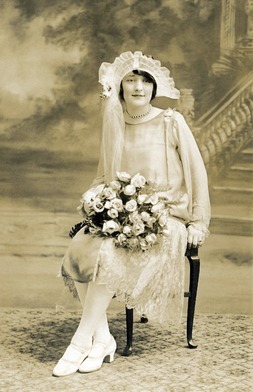 When re-styling the 1920’s look, the modern bride often opts for no veil and instead having a lace or beaded headdress. The Groom can also style himself in a real dapper 1920’s suit. Think pinstriped wide leg trousers, club collared shirts, and for the brave, contrasting jackets, with brogues to really finish off the look. The great news is metallics are perfect for 1920’s inspired weddings, and gold is used in pretty much every 20’s styled wedding. Think gold leaf decorated wedding cake, gold shoes, metallic writing on the stationary, and vintage, art deco brooches, watches etc as wedding favours. This wedding theme does not tend to lend itself to the budget savvy, however, 1920’s style bridesmaid dresses and wedding dresses are easily found on the high street, and affordable online retailers even now, a couple of years after the infamous Gatsby film release. Plus gold beads/ ‘diamond’ gems scattered around vintage glasses/empty vintage perfume bottles can all be sourced very cheaply and create beautiful table decorations. 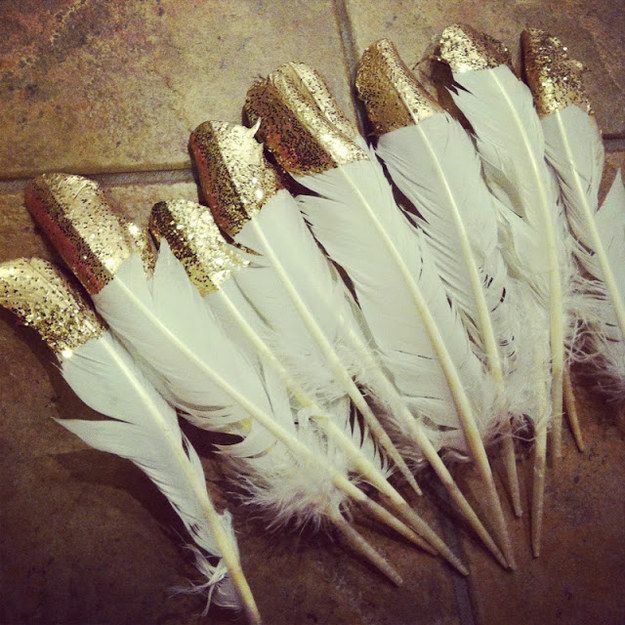 For a budget favour why not dip the tip of white feather in glitter and insert the inside of a cheap pen into the end? In my opinion there is nothing better than a usual wedding favour as people are more likely to take them home. Irrelevant of your budget a 1920’s style wedding is achievable for all – remember rationing and frugality was around in the 20’s so a Great Gatsby style wedding celebration was very rare. Have you had a 1920’s inspired wedding, or are you planning one? If so what is/was your budget? What budgeting tips would you give to fellow Bs2B? For me, my favourite part of any wedding is the ceremony. The ceremony IS the wedding to me, the rest of the modern wedding day is just “fluff”. If the worst came to worst it wouldn’t bother me if my wedding day consisted of the ceremony only. I’ve cried at every wedding, except for one, that I have been to and even watching people get married on TV has me welling up. The H2B and I will most definitely be doing our own personal vows alongside the normal vows (when we get our pack from the registry office closer to the time we will choose which set of their vows we want to use), but I want to do something else as well to really make the ceremony special and unique. I have previously looked at rose and sand ceremonies, but somehow neither of those feel “us”; so I’ve done some more research on how we can create a more memorable ceremony and one that truly reflects us as a couple. Maybe some of these ideas will help you too. 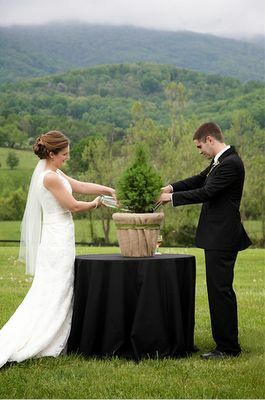 Before the ceremony, a tree in a pot is placed off to the side of where the ceremony would be taking place. During the processional, both mothers walk in with a small vase full of water and add it to a watering can. During the ceremony, the officiant speaks about the symbolism of the tree and how it relates to a marriage- the stable trunk, the outstretched limbs that offer comfort etc. The water that the mother’s brought symbolizes the love and nurturing that each family provided to bride and groom as they were growing up. When the couple water the tree they are giving the tree love to grow just as their families love will continue to support them in their relationship. An extra step that can be carried out if for the fathers to bring in a pot of soil from their home town which the Bride and Groom add to the tree pot before pouring the water. Celebrant: The Bride and Groom will now take part in a Tree Planting Ceremony, to symbolize the roots of their relationship, and the continued growth of their love, as they become each other’s family today. Love is the essence of human experience and emotion. It is the root of all and everything we, as humans, do. Love richens our experience, and fills our lives with meaning. It gives us a firm base from which to grow, to learn, and change. Let your relationship and your love for each other be like this tree you plant today. Let it grow tall and strong. Let it stand tall during the harsh winds and rains and storms, and come through unscathed. Like a tree, your marriage must be resilient. It must weather the challenges of daily life and the passage of time. And just like the tree you are planting, marriage requires constant nurturing and nourishment. Celebrant: Remember to nourish each other, with words of encouragement, trust, and love. This is needed on a daily basis so you each can grow and reach your fullest potential – just like this tree. 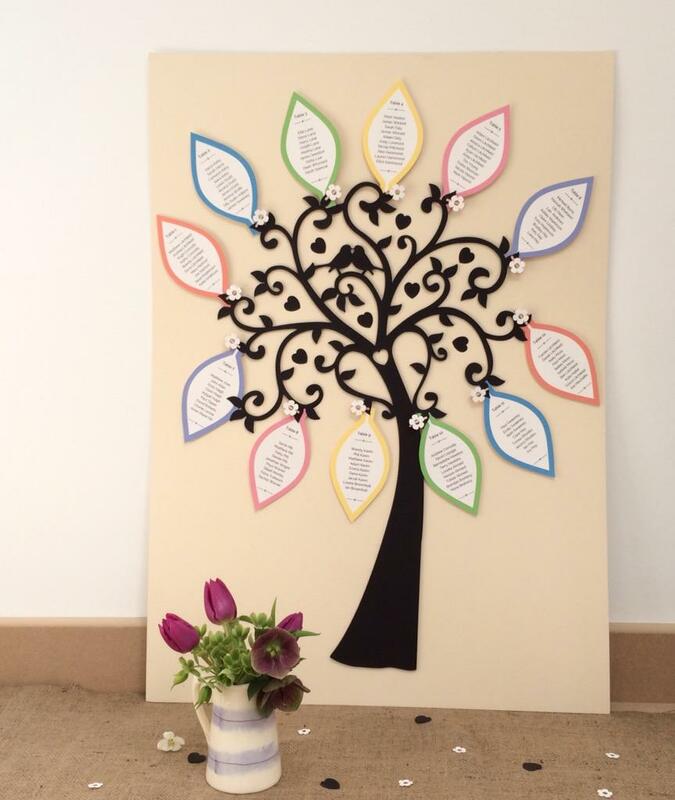 The Bride and Groom will plant this tree in their garden to always be a symbol of their love for each other. 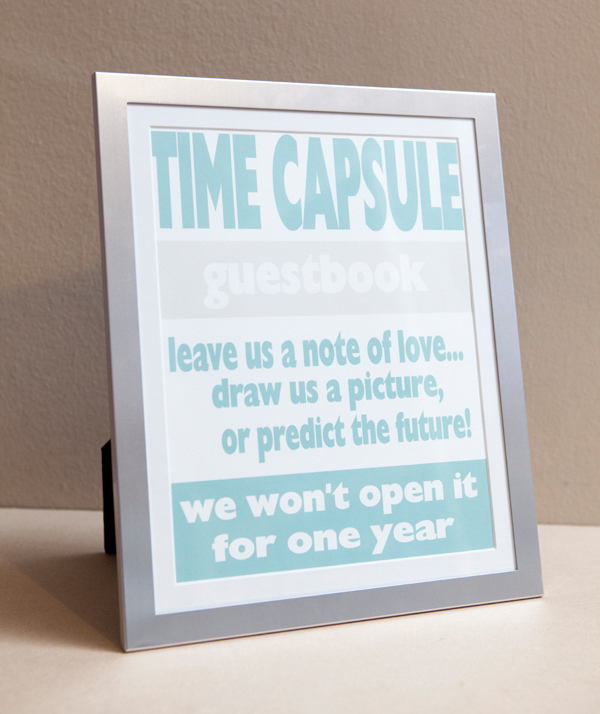 Invite any guest attending to write you a note that’ll be read when opening your time capsule at the agreed time, whether that be on your first, fifth or tenth wedding anniversary. The letters from your guests can include well wishes, advice for married life, predictions of what the next x amount of years will hold for you, favorite memories of you two together, or anything else they’d like to include (you can either include a card about this with your invitations, post about it on your wedding website, and/or have nice stationery and pens available at the venue). People could even put in a gift, or a memento they may have from your relationship together, such as ticket stubs, a photo or even a cracker from your first Christmas together. You can nominate a member of the wedding party to pass around the time capsule box during the ceremony for your guests to drop in their notes, or have the celebrant/registrar mention the time capsule and then pass it to someone near the front. Once the time capsule has been passed around, (to ensure guests have been given enough time to fill it maybe wait until after you’ve signed the register) seal it up as a couple until your chosen anniversary! To help remind each other of your love for each other put something in the capsule yourselves without showing each other as a surprise for each other when you open it. This idea really appeals to me, as something different to the usual unity ceremonies but involves all of your guests, and will help them to fill the moment when you are signing the register and posing for photos with your photographer. “I officiated a wedding earlier this year where the bride’s father, an accomplished craftsman, gave them a gorgeous wooden box engraved with the couples names and wedding date he had made himself. We arranged ahead of time for key individuals to bring something meaningful to place in the box. Each person wrapped their item so the bride and groom would not know what it was and included a letter to the future. We placed this ritual towards the end of the ceremony between a Declaration of Support and the Blessing of the Marriage. Today, (Bride and Groom), who began on separate paths, have been joined as one. You, their family and friends are a community of support for (Bride and Groom). Each of you, by your presence here today, is being called upon to uphold them in loving each other. I ask that you always stand beside them, never between them. Offer them your love and your support and refrain from judgment. Encourage them when encouragement is needed and listen carefully when they seek your advice. In these ways, you can honor this marriage. Therefore I ask, now that you have heard (Bride and Groom) exchange their marriage vows, do you, their family and friends, promise from this day forward, to encourage them and love them, and to help guide and support them in being steadfast in the promises they have made?” If you agree, please say, “We do.” ~ We do. Truly blessed is the couple who come to the marriage altar with the approval and blessings of their families and friends. At this time I would like to invite (Names) to come forward and place their tokens of support for (Bride and Groom) into this time capsule, lovingly prepared by (Bride’s) father.